Founded in 1974, the Association is a statewide professional organization for people working, studying and interested in all areas of northern anthropology. Today, the Association has over 200 active members in Alaska, the United States and countries including Canada, France, Denmark, Norway, and Japan. For more than thirty years its members have helped to break new ground in basic and applied research, to build collaborations between researchers and communities, and to foster public knowledge and interest in circumpolar cultural heritage. The Association’s annual meetings are an international forum for projects in archaeology, linguistics, cultural studies, oral history, medical anthropology, museum exhibitions, cultural resource management, human genetics, and more. Our peer-reviewed publications – the Alaska Journal of Anthropology and Aurora monograph series – hold a growing and respected place in the literature of the north. 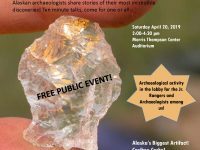 The Alaska Anthropological Association is a non-profit 501(c)(3) corporation that depends on dues, contributions, and the volunteer efforts of its members. It offers student, regular, and institutional memberships, all including an annual subscription to the Alaska Journal of Anthropology.